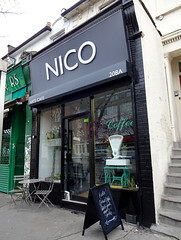 Small cafe in South Norwood. It opened in January 2019. The ground floor seats about a dozen people with a combination of three tall stools, a couple of basket chairs, a wing-backed leather armchair, and six upright chairs at a long, reclaimed-plank communal table. Fresh flowers sit in vases on the tables, potted plants stand in corners, and a candle flickers against the mirror that occupies one wall. Art books are displayed on shelves, and both 2D and 3D art hangs here and there. In the basement is another seating area, dimmer and cosier. Kake visited on a Friday lunchtime in March 2019. There were two other customers when I arrived a little before 12:30pm, and others were in and out throughout the afternoon, some seemingly regulars. Music was playing, not too loud. The kitchen space is small, and hence so is the menu, but it's a well-chosen selection based on poached eggs on muffins plus panini. They also have a selection of house-made cakes. Kake tried one of the poached egg variations, "Ellie's favourite", comprising two poached eggs on a halved muffin with hollandaise, pesto, and sundried tomatoes (£7.50) photo. It was pretty good. The yolks were mostly runny, and the hollandaise was a competent vinegar-forward rendition. The pesto and sundried tomatoes made a really nice change from the usual eggs benedict/royale/florentine, and the fresh parsley added yet another flavour note. I'd order it again. Earl Grey tea was made with a bag, but came in a stylish (albeit fragile) glass teapot, and the cup was pre-warmed. They also have around two dozen Pukka teas. Service was friendly and helpful, and very patient with a rather talkative customer. They have WiFi, which doesn't require a password, and several usable power sockets including one with phone chargers ready plugged in. Child-friendliness: They have at least two highchairs (IKEA Antilop without trays), and there's a pull-down nappy change table in the toilet (which is unisex, and in the basement). There was a baby in a buggy present on our visit. Accessibility: A step to get in. A narrow, steep staircase with a bend at the end to get to the toilet; at the time of our March 2019 visit this had a handrail on one side most but not all of the way down, but they told us they're planning to put a handrail on the other side and to make sure there's a rail all the way down. Last visited by Kake, March 2019. Opening hours taken from sign on door, March 2019. Last edited 2019-04-07 14:36:19 (version 4; diff). List all versions. Page last edited 2019-04-07 14:36:19 (version 4).